Did you know that the word "God" is NOT a name? The root-meaning of the name (from Gothic root gheu; Sanskrit hub or emu, "to invoke or to sacrifice to") is either "the one invoked" or "the one sacrificed to." From different Indo-Germanic roots (div, "to shine" or "give light"; thes in thessasthai "to implore") come the Indo-Iranian deva, Sanskrit dyaus (gen. divas), Latin deus, Greek theos, Irish and Gaelic dia, all of which are generic names; also Greek Zeus (gen. Dios, Latin Jupiter (jovpater), Old Teutonic Tiu or Tiw (surviving in Tuesday), Latin Janus, Diana, and other proper names of pagan deities. The common name most widely used in Semitic occurs as 'el in Hebrew, 'iluin Babylonian, 'ilah in Arabic, etc. ; and though scholars are not agreed on the point, the root-meaning most probably is "the strong or mighty one." So this is telling us that the word "God" is a title that can be used in various instances, it also states that "God" can be used for several deities! This is again WHY its critical that we call the Heavenly Father (the true supreme ALaHiYM and Creator of the universe YaHuWaH) by His correct name which distinguishes Him from ALL other false deities. The word Gäd / Gawd is pronounced exactly the same way as “God”. We see that the definition of that word in the bible concordance (H1408) is a pagan name for the Babylonian, Syrian, and Canaanite deity of fortune. Scripture says we should NOT defile His name or even speak the name of another ALaHiYM (mighty one), yet every SUNday (SUN god worship day) the Christian churches are filled with people giving praises to the deity of fortune “God” (this is also the ALaHiYM people entrust on the dollar bill). 13 And in all [things] that I have said unto you be circumspect: and make NO mention of the name of other gods, neither let it be heard out of thy mouth. 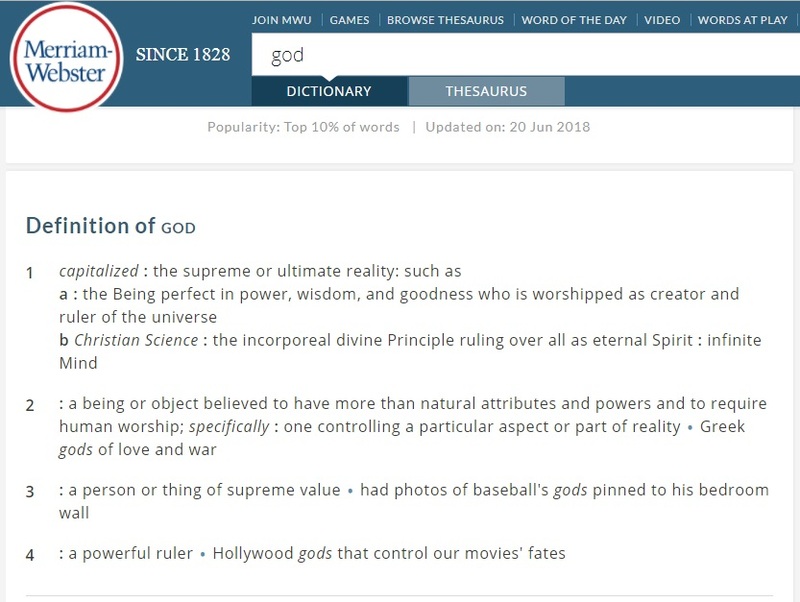 Notice that not once in any of these definitions does it says that the word "God" is a name. Interestingly it does state that in English "God” is an image, an object that is worshiped, and is an idol; capitalizing a letter at the beginning of a word does NOT magically make it a name. The Creator YaHuWaH is a jealous ALaHiYM (ShaMuWTh 20:4-7, Deuteronomy 4:24 and 32:16) and worshiping ANY images, objects or idols is something YaHuWaH commands us NOT to do (ShaMuWTh 20:3-6 "Exodus"). YaHuWaH was VERY clear in this commandment, yet in Christian / Catholic churches and homes, crosses / images of a Latinized / European man are on the walls, his photo is posted on social media and EVEN statues are erected of him right on the church grounds! With these facts in mind, why is it that Pastors and Christians insist on calling the Heavenly Father by this pagan title? Why, because the Babylonian, harlot, Christian churches were specifically designed to deceive minds and to hide the truth. The forefathers of old inherited these lies in slavery, and due to tradition they have ignorantly passed these lies down through the generations (YaRaMiYaHuW 16:19-20 "Jeremiah"). Scripture tells us that our hearts are wicked (YaRaMiYaHuW 17:9 "Jeremiah") and that when we accept the RuWaCh of truth, we are given a new heart (Ezekiel 36:26). How we address and reverence the Heavenly Fathers true name determines where our heart is. We know there are many false ALaHiYM's (god's) of this world and the Creator does NOT want to be lumped in with them by way of a generic title or a pagan name. We must be specific as to what ALaHiYM (or God) we are praying or giving thanks too, because we know Satan is ALSO a God, Gäd, Gawd, Dios, ALaHiYM or Theo’s. Satan knows that if he can trick people and get them to call on ANY OTHER name besides the true name of the Heavenly Father YaHuWaH and his son YaHuWShuWA, he has succeeded! The apostles of old in ancient times held the Creators true NAME in high regard and were ready to defend and die for it. The set apart people KNEW that blaspheming the name of the Creator was a serious matter, thus they reverenced YaHuWaH’s name and put it in its proper place (Leviticus 24:16). When people choose to call YaHuWaH “God”, it gives recognition and merit to a false ALaHiYM. Sadly, today's lukewarm pastors and Christians in churches all over disobey his commandment and choose to stay in rebellion. Pastors with seminary degrees, professorships, worldly accolades, and Christian theologians KNOW this is true, yet still praise and call on the name of God, instead of destroying the images and names of false gods out of their mouths. YaHuWaH tells us many times in scripture that he does NOT want to be called anything other than his truth name. So how do you think HE feels when people (who know this to be true) compromise and call him LORD (BaAL the sun God) or God / Gawd (the pagan deity of fortune)? 3 And ye shall overthrow their altars, and break their pillars, and burn their groves with fire; and ye shall hew down the graven images of their gods, and destroy the NAMES of them out of that place. 4 Ye shall not do so unto YHWH your ALaHiYM. 16 And it shall be at that day, saith YHWH, that thou shalt call me Ishi (H376 = husband); and shalt call me no more BaALiY (H1180 = my LORD). 17 For I will take away the names of BaALiYM (H1168 = LORD) out of her mouth, and they shall no more be remembered by their name. YHWH clearly commands that only by his and HIS son’s name are we saved and in the end we ALL are accountable for our own souls (YaHuWChaNaN 3:18, 14:6 "John", Acts 4:12, Joel 2:32 and AlaPh YaHuWChaNaN 3:23 "1 John"). Sadly, many useless prayers are being made to “God / Gawd / Gäd (by those who are in the know) in churches everywhere and because their minds have been conditioned by tradition, and by their pastors, these people remain delusional believing that YaHuWaH will STILL answer their prayers (YaShaYaHuW 1:1-22 “Isaiah”). Pastors put on a charismatic and emotional outward show making people believe they care, but they really DON’T love their flock enough to tell them the truth (which will save their soul). If we truly love the Creator we must STOP using the title God / Gawd / Gäd; because 1) we are told by YaHuWaH in ShaMuWTh 23:13 “Exodus” not to 2) this is NOT the Creators name 3) it has pagan connotations to it and 4) it has NO power, NO redemption and NO answer will come to prayers using this pagan title. Which one? God is title NOT a name! Satan, Buddha, Amen-Ra, Krishna, Allah, all these are false gods so who are you allowing to blessing you??? Christians say that no one is perfect, NOT even their loving pastors, but this is a cop out and contradicts scriptures. We are specifically TOLD in scripture to be perfect (MaTaThiYaHuW 5:48 and 19:21 "Matthew") and if this WAS NOT attainable, then YaHuWShuWA wouldn’t have said it. The word "perfect" occurs 99 times in 94 verses in the KJV bible and what churches fail to teach is that perfection is NOT mental or physical but spiritual. Spiritual perfection comes when we accept YaHuWaH’s set apart RuWaCh (spirit) in our heart, which is YaHuWShuWA his son, when this happen the maturing of the person RuWaCh become perfect / complete. Meaning: "to be complete, be finished, perfect, make whole, make sound"
When you have the true set apart RuWaCh (the spirit of YaHuWShuWA) living in your heart, your desires and wants are no longer about you (Ezekiel 36:26) since this new heart desires ONLY what YaHuWaH wants. For instance, taking part in pagan holidays are a thing of the past, wearing pagan symbols or objects around your neck is a thing of the past and calling the Creator “God / Gawd / Gäd” is a thing of the past, why because it is NO LONGER about us (2 Corinthians 5:17). If we love the Creator, we will obey him (YaHuWChaNaN 14:15 “John”)! For those who are ignorant of this truth they are exempt for a season (Acts 17:30), but once someone is shown they are in error (2 Timothy 3:26) and if that person’s heart is true to YaHuWaH, THEY WILL CHANGE THEIR LIFESTYLE AT ALL COST; hence propelling them another step closer to perfection / spiritual maturity (MaTaThiYaHuW 19:29 “Matthew”). Christians say the Creator has many names but again that totally contradicts scripture. How many names did YaHuWaH give MaShaH (Moses) at the burning bush, ONE! Did YaHuWaH tell MaShaH in ShaMuTh 3:15 (Exodus) "These are my names forever?" or "These are my titles forever? ", NO! How many names did the MaLAK (messenger / representative) give MaRiYaM (Mary) to name her son, ONE! In Acts 4:12 it does not read "for there is none other titles" or "for there is no other names (plural)" NO, it said "for there is none other NAME" (singular)! More titles, they only describe attributes of YaHuWaH and YaHuWShuWA but they are NOT names! Apostle ShauWL (Paul) said it best to the people of Philippi (which WAS a city in NOW eastern Macedonia), “press on to possess perfection” (Philippians 3:12). Now that you know how YaHuWaH feels about the pagan title god, will you make the correction (2 Kafa 2:21 “Peter”)? When praying, begin using the true and proper name of YaHuWaH to indicate the correct deity, Dios, ALaHYiM, or Theo’s to whom you are praying to. In our conversations when taking about the Creator YaHuWaH, we should NOT use the term “God / Gawd / Gäd” to disrespect him, but rather be proud, specific, and call on the one and only true Hebrew name of the Creator YaHuWaH. Otherwise we will be profaning the name of YaHuWaH and setting a different deity on high (Ezekiel 36:23). The word “God” is NOT YaHuWaH’s name. Will you continue the LIE along with the masses or stand on the TRUTH with YaHuWaH’s elect few? Relief from Dura-Europos depicting the god "Gad" of Dura (center), king Seleucus I Nicator (right) and Hairan son of Maliko son of Nasor (left). Paul Nwagha beautifully explains that “LORD” and “God” are ONLY titles! What “God” or “LORD” are you praying and asking to BaRaK (bless / give favor) you? ACh (brother) Michael (from Followers Of The Way) crushes the worldwide lie that YaHuWaH has many names! ACh (brother) Michael (from Followers Of The Way) exposes the deception behind the false pagan title "the LORD"
Minister Bennett (from ShaluwmYah) declares to the world that knowing and proclaiming the Creators true name “YaHuWaH” DOES MATTER! Once the truth is given to a person, and if that person TRULY loves the Creator, HE is expecting they make an immediate change, NOT take their sweet time getting there when they feel like it!